When it comes to marketing, different types of businesses require different strategies in order to be successful. While there are some things that are inherently necessary (staying organized and planning ahead), there are also unique obstacles to keep in mind when marketing for a restaurant. As Restaurant Week approaches once again, we recently reflected on our recent work with King of Falafel & Grill. Earlier this year, we touched up some of their graphic design and branding. Along the way we found 5 important things to consider when marketing for a restaurant. Before getting started with marketing your business, it’s important to know your brand, create your identity, and be consistent. This might seem like a simple step, however it is one that can often be overlooked with any business type. Once you make a decision on the type of brand you want to be and your message, stick with it. This will save time, money, and a lot of headaches down the road. This decision helped figure out what the visual aesthetic of King of Falafel would communicate to the customers. It was important to stick with a similar look and feel that was already there because that’s what customers know. While some businesses think that giving their entire business a makeover is necessary, that is rarely the case and can instead lose customers who are looking for the brand they know. Marketing is extremely important for a business, and in order to maximize the effectiveness of it, a specific marketing budget should be set aside. A higher budget doesn’t necessarily mean better results, however, it can make different tools and options available when creating a strategy. While working with King of Falafel, we decided that in order to effectively use the marketing budget, part of the funds should go towards a TV menu board. As the price of ingredients fluctuates in the market, restaurant menu prices will need to change too. In order to avoid reprinting costs for traditional menu boards, we found that the TV menus were a smart decision. An alternative option for restaurants is to create a menu on chalkboards, which can add an artistic flavor to the appearance of the business. Working with restaurants presents a unique challenge that other businesses don’t face: designing an effective menu. Menus need to find a perfect balance between pleasing text and mouth watering images of feature foods. While it might be tempting to provide an image for every item on the menu, this can become distracting and take away from the “WOW” factor that feature items should have. Choose images carefully and highlight the best of the best to maximize your impact. Once you’ve decided on the perfect blend of text and pictures to put on a menu, it’s time to make the menu engaging. This is especially important for restaurants that create printed menus for customers to take home. While there’s often a menu online, some people will always prefer a physical copy for them to look over. If you’re creating a take-home menu, make sure the menu is engaging visually and something that the customer would want to pick up. High-quality images and an easy to navigate menu will maximize the effectiveness of your menu and simplify the experience for your customers. This will also minimize the number of customers who throw away printed menus. Your customer’s experience is key. While working with King of Falafel, we agreed with KOF that TV menu boards were the best way to keep an updated menu at all times. One thing that needs to be noted about this is legibility. 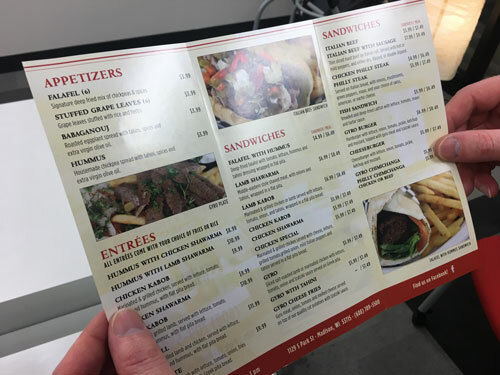 It is always important to place yourself in the shoes of a customer when looking over a menu on a 40 inch TV or while looking at a printed tri-fold menu at the table. At IH Concepts, we personally tested the visibility of the text on a 40-inch screen and spent time experimenting with font sizes. By doing this, we were able to design a menu board that was visible to customers at the appropriate distance they would be standing away from the menu. Menu boards are a type of signage, and legibility is always essential to providing a positive customer experience. The restaurant business is an industry that is competitive. With so many choices of cuisine for restaurant goers to choose from, having a plan, being strategic and engaging, coupled with great design will make you stand out and increase the chances of your restaurant being the talk of the town, ensure long-term success.